In Shaiva Siddhantam, Purusharta goals – dharma, artha, kama and moksha, in Tamil – Aram, Porul, Inbam, Veedu, by implication, extends to a fifth goal, Aathmikha Anbu meaning pursuit of Love. This love is not related to body consciousness but to the Self. 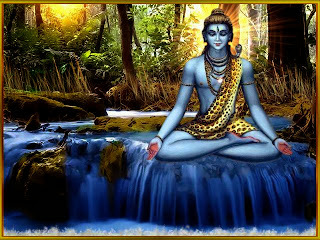 It is spiritual love beginning with the concept of dhaasoham - I am your servant to culminate in Soham – He and Me are One, that is Sivoham, the expression of Divine Oneness. That is the inner Satyam, Jyoti and Dharmam. Without dhaasoham feelings you cannot experience Soham. Hara Hara Mahadeva. ANKURA ARPANAM. Before laying of the actual foundation in any holy, temple, educational or ashram site, the Earth Goddess herself is impregnated in a symbolic process known as ankura-arpana. Ankura meaning seed and arpana signifying an offering. So, akurarpanam means ‘sowing of the seed.’ In this ritualistic process, seeds are planted at the selected site on an auspicious day. Traditionally, nava dhanya or nine types of grains are planted in 16, 12 or 8 earthen pots known as Palikas made of gold, silver, copper or mud pots. The details of exact size, shape for palikas should be taken from any standard Agama texts. Samurtarchanadhikarana states "Ankurarpana hinam yatkarma ca asuramiritam" - any festival that is celebrated without amkurarpana in a temple is of a demonic nature and hence is not desirable. The essence of this ritual is to make a sankalpa to celebrate a Utsavam or festival and get the grace of the Lord. Sastras prescribe doing ankurarpana nine days before the festival and if not possible seven, five or three days before Brahmotsavam. 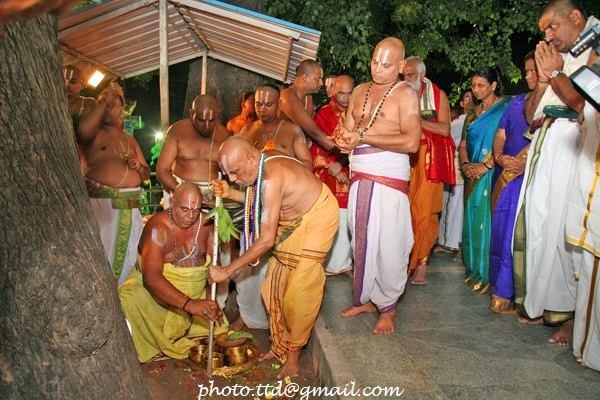 The planting symbolizes the creation of new life and invites the celestial planets and their Aadhi Devatas in the site in question. The germination is observed after a few days. If the growth is satisfactory, the land is deemed suitable for its purpose. In temple sites, their germination and growth is seen as the symbolic beginning and prosperous growth of the Temple, or the abode of the God. The divine energy from these three sources are transferred to the idol through the various rituals described, to transform the idol to the Deity with divine power. In in the Southern Tamil tradition, ankurarpanam is done as part of wedding ceremonies. 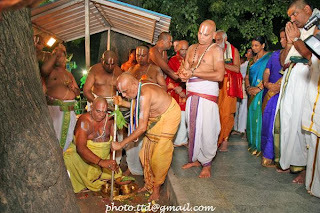 Muhurtha Kaal, the first pole to the ‘panthal’ or wedding green tent planted three days prior to the wedding proper, sees a square at the base where navadhanya is planted. The germination of the seed is a metaphor for the fulfillment of the inherent potentialities which lie hidden in Mother Earth, and which by extension are now transferred to the sacred structure destined to come over it. Curiously healthy germination is also referred to as Lakshmi Gadacham, the blessings of Lakhmi Maa, the Goddess of Wealth and Prosperity to the exclusion of Her sister Alakshmi, Goddess of Misfortune, Barrenness and Strife. It is not Saraswathi Gadacham or Parvathi Gadacham, get the drift that ‘porul illarkku ivvulakan illai’ those deprived of material wealth are not of this world…! Nature in the Hindu Way of Life. ©Yogeshwarananda Saraswathi. Hara Hara Mahadeva. Subscribe and follow by e~mail.